America is rapidly becoming George Orwellï¿½s fictional totalitarian state, Oceania. Thatï¿½s because many Americans have accepted their surreal role as proles. Proles [short for proletarians] are that class of citizens who are willing to let someone else do their thinking for them, so long as that someone else provides for their basic needs and temporal desires. Like wandering sheep, proles are the willingly ignorant, the dumb on purpose ï¿½ the stupid. About 40% of Americans can best be described as functionally illiterate. That means they may be able to read [a little] but canï¿½t understand what theyï¿½ve read ï¿½ like ballot box instructions ï¿½ or perform simple addition and subtraction without the aid of a calculator or computer. But does that mean 40% of Americans are proles? Ignorance alone is not the primary characteristic of a prole. Itï¿½s a willingness to be or be kept ignorant. Weï¿½ve all experienced a time when a sales clerk couldnï¿½t give us back correct change without that computerized cash register. Your total was $17.17. You gave her a $20 bill then gave her a quarter, expecting back $3. 08 in change, rather than $2.83. You know you canï¿½t do that. Hereï¿½s another example: I love peach milkshakes, something Hardeeï¿½s used to have on its menu here in North Carolina until a few years ago. Peach shakes stayed on its menu in the Peach State though, so I always made a point during my annual pilgrimage to stop at Hardeeï¿½s near my familyï¿½s hometown in southwest Georgia. When I stopped by recently, I purposely asked the young lady if they still had peach milkshakes on the menu. She said ï¿½Yes.ï¿½ I repeated the word ï¿½peach.ï¿½ She said, ï¿½Yeah, peach.ï¿½ So I placed my order, but when I got my ï¿½orangeï¿½ milkshake, I complained that sheï¿½d told me they still had peach milkshakes. She seemed dumbfounded when I asked her why my peach shake tasted like orange. ï¿½They be the same,ï¿½ she said. Iï¿½m glad this young lady isnï¿½t a surgeon, soldier, nuclear scientist, preacher, police officer, etc. Neurology and proctology. They be the same. Islamic terrorists and fundamentalist Christians. They be the same. With such a limited knowledge base, what do you suppose folks like her are able to do for themselves? She apparently canï¿½t handle a fast food job. Maybe she should run for political office. But even Americans with some technical skills have been conditioned to set aside their ability to think on their own. Is it possible that someone in academia, big business, the entertainment industry, government courts & bureaucracies, the news media, mega-church corporations & cults and subversive organizations are telling them what and how to think about religious, social, economic, education and political issues? Obviously, I canï¿½t discuss each of the principal malefactors behind the real-life concept Orwell called Newspeak. Iï¿½ll focus on what I know for now and document further research on the others later. Iï¿½ll call it Principals of Newspeak. But have you ever wondered why we call unborn babies fetuses, rather than babies? You can kill a fetus but not a baby. That would be wrong. One hundred years ago, ï¿½gayï¿½ meant ï¿½happy,ï¿½ but today it describes the politically correct lifestyle of sodomites. Why is it though that every time we see gays in the news, they donï¿½t appear to be very happy at all? Who conditioned us to accept these subverted, NARAL definitions for babies and perverts? Whoï¿½s controlling how you think about a particular issue? Iï¿½ll discuss the first group listed above, or at least part of it. Academia consists of more than just public and private schools but also colleges and research centers. I wonï¿½t talk about the history of public schools. If you want that, I very strongly recommend Bev Eakmanï¿½s Educating for the New World Order, John Taylor Gattoï¿½s Underground History of American Education or Charlotte Iserbytï¿½s the deliberate dumbing down of america. I also wonï¿½t discuss research data and statistics either, but if thatï¿½s what you want, I highly recommend Dr. Samuel L. Blumenfeldï¿½s The Whole Language/CBE Fraud, E.D. Hirschï¿½s Schools We Need, Joel Turtelï¿½s Public Schools, Public Menace, Dr. Bruce Shorttï¿½s The Harsh Truth About Public Schools, Marlin Maddouxï¿½ Public Education Against America or Charles Sykesï¿½ Dumbing Down Our Kids. How did many Americans become functionally illiterate? It all starts with reading. If children never learn to read, they canï¿½t read to learn. And if theyï¿½re not equipped for independent study, they can be controlled ï¿½ just like Orwellï¿½s proles. By taking advantage of minority and low income parents who tend to be less educated and whose children are less likely to hear them speak correct grammar or enunciate words properly, this strategy says some children are going to have trouble with phonics, which will require them to learn 44 phonetic sounds, teaching them to sound out letters, groups of letters then words until, by the end of the 4th grade, they will have developed a 24,000 word vocabulary. But when using Deconstructionistsï¿½ whole language method, which requires kids to memorize whole words presented to them on flash cards or other media, by the end of the 4th grade, theyï¿½ll have amassed a measly 1,600 word vocabulary! Their vocabularies will be short, and they wonï¿½t be able to read, really read, but theyï¿½ll be made to feel really good about their stupidity. Tied in with the above strategy, those same children of minority and disadvantaged students who havenï¿½t learned correct grammar or word usage and who, without phonics, have never learned proper spelling rules or sentence structure will have great difficulty with writing. To compensate for their poor writing tests and essay scores, teachers are told not to grade students on the above shortcomings. Teachers are to consider whether the child kinda, sorta answered the prompt and assess the total impression of the childï¿½s writing. Of course, this will not make the child a better writer, but heï¿½ll have great self-esteem. Everybodyï¿½s different. We are a diverse people. Some of us learn by seeing, some by hearing, some by activity/doing, but only a few by reading. Thatï¿½s true. Really! Some kids never learn to read (See Whole Language), especially the minority boys targeted above; so, as they enter high school, they now canï¿½t read to learn. No remedial training is necessary though; the teacher must now read to/for these students. Oh, these diverse learners are only unofficially labeled [no IEP], but thatï¿½s just a technicality. The minority student labeled as diverse above and the one labeled LD need help. They canï¿½t read or write, thanks to the first two strategies; so, hereï¿½s the plan: For every class assignment or project, weï¿½ll put these special students with motivated students [via mixed ability grouping] who can read. The latter will do all the work, but all students will get credit for doing it. Everybody cooperates and No Child gets Left Behind. By this point, most of your disadvantaged kids have some kind of label, or they are severely lacking a lot of core knowledge. You simply canï¿½t expect them to read assignments or take notes, much less write formal essays. What you must do is allow them to draw pictures or cut out paper dolls, or in some visual way express how they feel about a theme or major concept in the story you read to/for them. Just draw it! These kids arenï¿½t going to learn anything now anyway, what with all the above strategies. We may as well get as many of them through The System as fast as we can. Instead of 180 50-minute classes per course, weï¿½ll let them have 90 90-minute classes per course. Their attention spans will limit them to about half of what could have been taught, so letï¿½s at least try to save the tax payers some money. You believe that, right? Now to implement these prole-producing teaching strategies, you must have cooperation from your teachers. That was slow in coming, but it too is succeeding as the old guard slowly fades away due to age but especially administrative and peer pressure. Teachers are gauged by their class averages and failing ratings, with an assumption that low class averages and high failing rates prove the teacher is not using the above multicultural, research-based and field-tested strategies and terminology or failing to meet the needs of diverse learners. Still, there are some teachers [like me] who arenï¿½t intimidated by their threats and biased reviews and continue to teach what kids need to learn. To restrain dedicated teachers, administrators endeavor to fill their days with paperwork and meetings, meetings and paperwork. The paperwork involves validating or refuting the above labels. The meetings are indoctrination sessions designed to brainwash teachers to accept all of the above strategies. The idea behind this paperwork and meetings strategy is to keep teachers too busy to actually teach. Eventually, he or she will submit to Big Brother or have a stroke or heart attack or resign. Those few who still continue to resist [like me] are monitored by the Strategy Police until their thoughtcrimes ultimately bring about the end of their teaching careers. In 1983 a government [Yes, a government study thatï¿½s critical of government schools.] published a report called A Nation At Risk, which was an ominous warning about public school failures. For nearly 25 years, our leaders have paid only lip service to that report, thus turning it into a self-fulfilling prophesy. America is now at risk of becoming a nation of proles! Orwell, George. Nineteen Eighty-Four. First printing 1949. New York: Signet Classic, 1950. R.C. 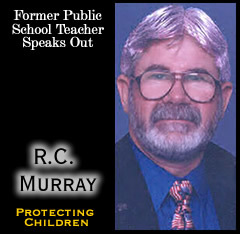 Murray is a disabled veteran and former public school teacher. He left a good job as a technical writer for a satellite manufacturer in order to teach high school English, only to immediately be told he could not expect, much less require his students to read their literature assignments. After four years of fighting The System and having a stroke then a mini-stroke, he decided he was safer in the airborne infantry and returned to being a technical writer for a military contractor. He has also dedicated the rest of his life to exhorting parents about whatï¿½s really going on in their local public school, the one they think is a good school. R.C. Murray is the author of two books, Golden Knights: History of the U.S. Army Parachute Team and most recently, Legally STUPiD: Why Johnny doesnï¿½t have to read.